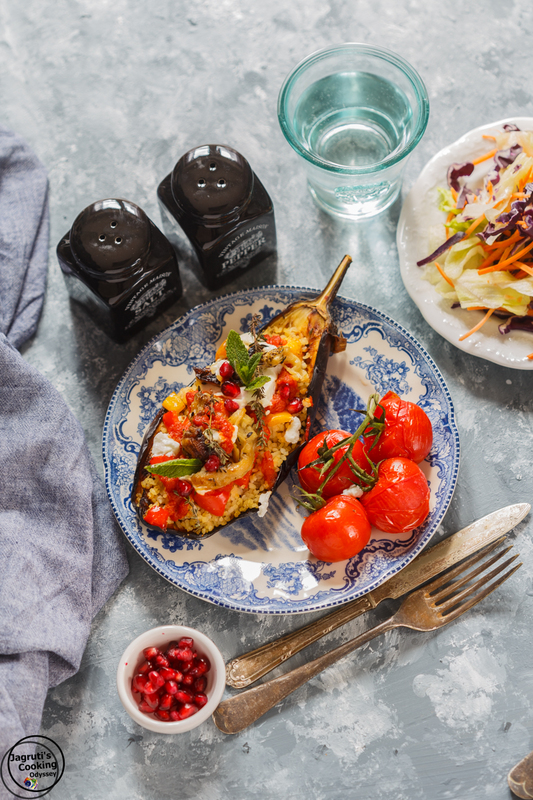 Vegetarian Stuffed aubergines with Bulgur and Buckwheat, are incredibly tasty stuffed aubergines with healthy ingredients such as Bulgur and Buckwheat and topped with sweet and juicy roasted peppers, tangy, spicy and sweet tomato sauce and finished off with crumbly Goats Cheese! This recipe is made with wholesome ingredients and contains plenty of nutrition. ''Ma put the TV on and watch BBC 1 right now, you'll like this programme'' a couple of months ago I had a text from daughter, I obeyed and turn the channel to BBC 1. The programme was 'Royal Recipes' hosted by Michaell Buerk, programme was all about royal themed food. I liked the whole series of Royal Recipes, glad I watched it as I came to know so many interesting stories and history. I like history, I do quite like the royals and the glam of it all. Well, and I love the gossip! I liked few recipes which were loved by the royals and cooked by the royals. 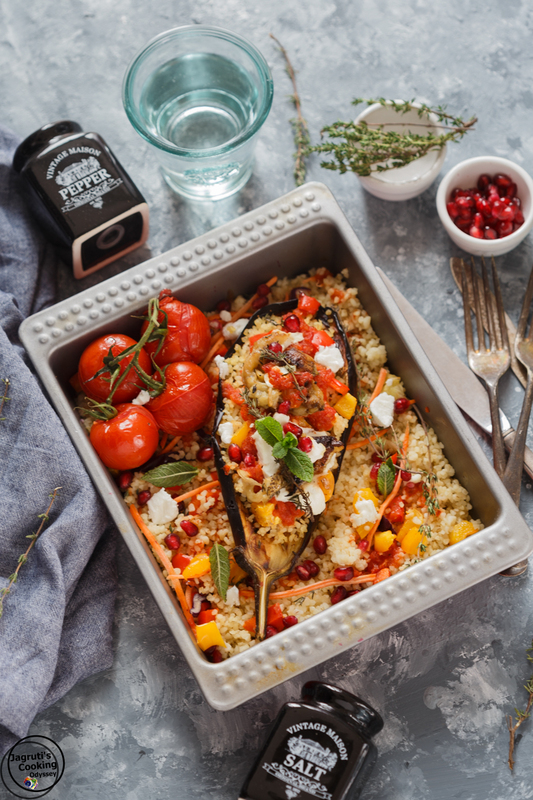 A recipe which I liked straight away and had an urge to make it was Stuffed Aubergine with bulgur wheat, prepared by late Princess Diana's former chef Carolyn Robb, she said that this dish was one of the favourites of Diana. She said "this is the dish that although it may be fit for princesses it is really fit for anyone, it's just simple home cooking, it's nourishing, it's warming". I completely agree with Carolyn Robb, after I tried and tasted this dish, that you can't do much better than this! These stuffed aubergines were incredibly tasty that I nearly fainted with pleasure at the delicious flavour of this dish ! 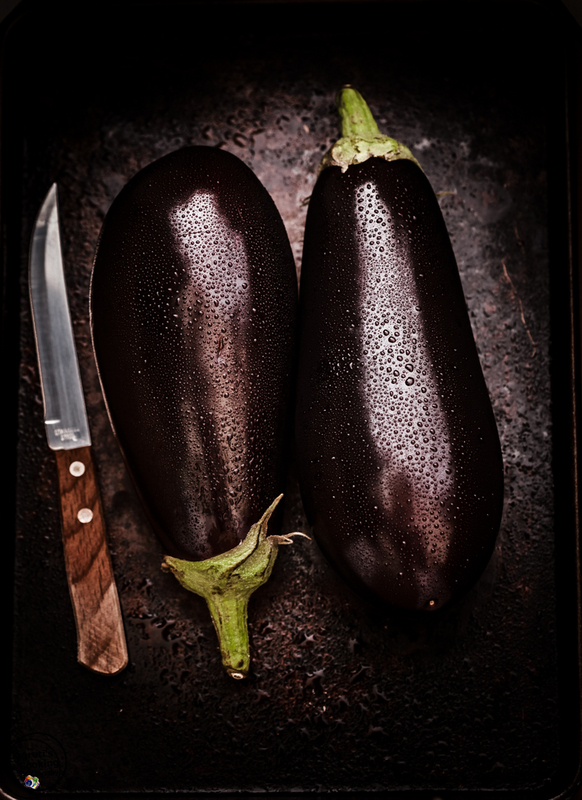 Now that summer is on its way in my part of the world, fresh and giant aubergines are plenty in markets and shops and cheap too. I am on a roll to make these stuffed aubergines. First time I followed the recipe to T, but then made a very small couple of changes, still, the dish came out so well. I love everything about this dish, all the ingredients, method, and fuss-free recipe. While the stuffed aubergines were baking the evergreen herb thyme heady aroma was just making me impatient, actually, thyme adds a warm flavour. I served with roasted tomatoes and fresh salad, it would make a lovely lunch or supper. You can omit buckwheat and prepare with Bulgur wheat only. Carolyn prepared bulgur wheat in a pan with onion and thyme, where I cooked bulgur and buckwheat in a pressure cooker with vegetable stock to save time. To make gluten-free version omit Bulgur wheat and use quinoa. You could also top with a dairy free cheese instead of a goats cheese to make this dish vegan. 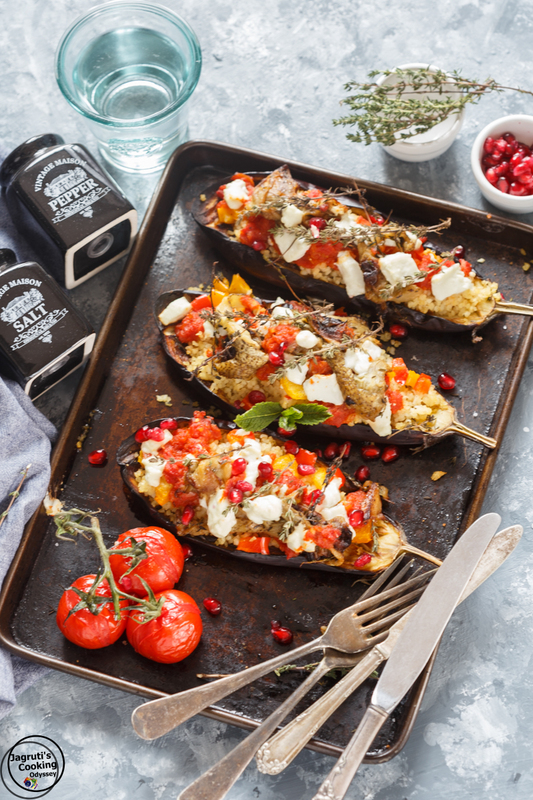 These soft and tender aubergines are stuffed with bulgur and buckwheat, colourful roasted peppers, sweet, spicy and tangy tomato sauce and topped with goats cheese are so delicious, flavourful and filling. Wash and pat dry aubergines and slice in half lengthwise through the stalk. With a knife score the flesh in a criss-cross pattern. 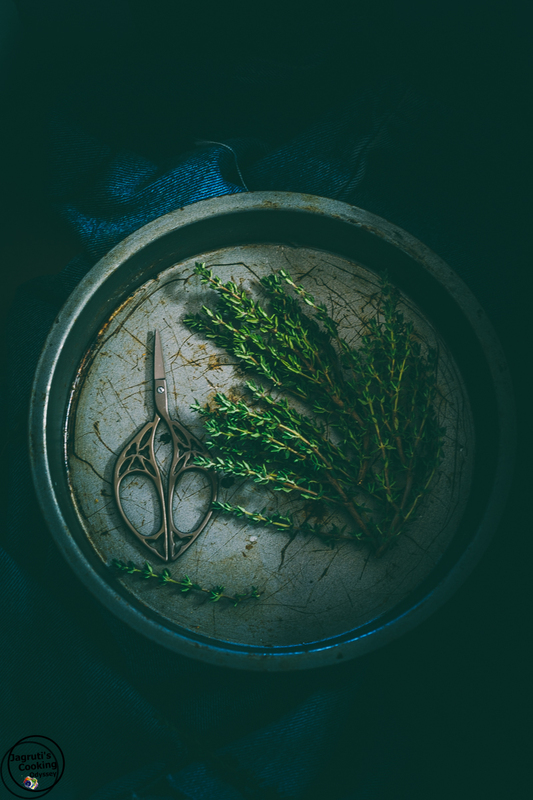 Drizzle some oil, sprinkle salt and pepper and a couple of sprigs of thyme. Bake it in the oven for 30-35 minutes or until flesh is soft and tender. Meanwhile, wash bulgur and buckwheat and drain the water and cook with vegetable stock. ( I cooked in a pressure cooker ). Leave it aside. Heat a little oil in a pan and saute onion and garlic for 3-4 minutes. Add chopped tomato, salt, sugar, and chilli flakes. Turn off the heat and leave it aside. 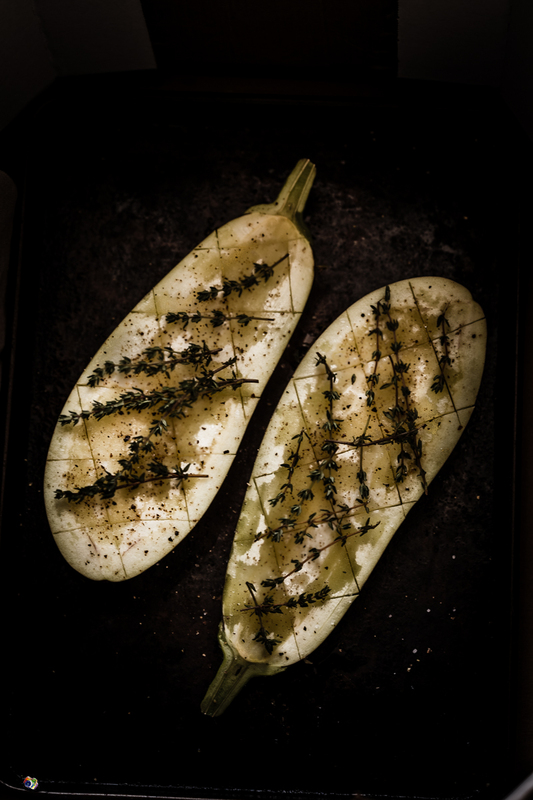 Now place chopped pepper on a baking sheet, drizzle little olive oil, salt and pepper and put it in the oven for 8-10 minutes. Once aubergines and peppers are roasted remove it from the oven. Do not turn off the oven. Using a spoon scoop out half of the flesh out of the baked halved aubergines. Leaving the skins with the layer of flesh. Stir the aubergine flesh into cooked bulger and buckwheat. 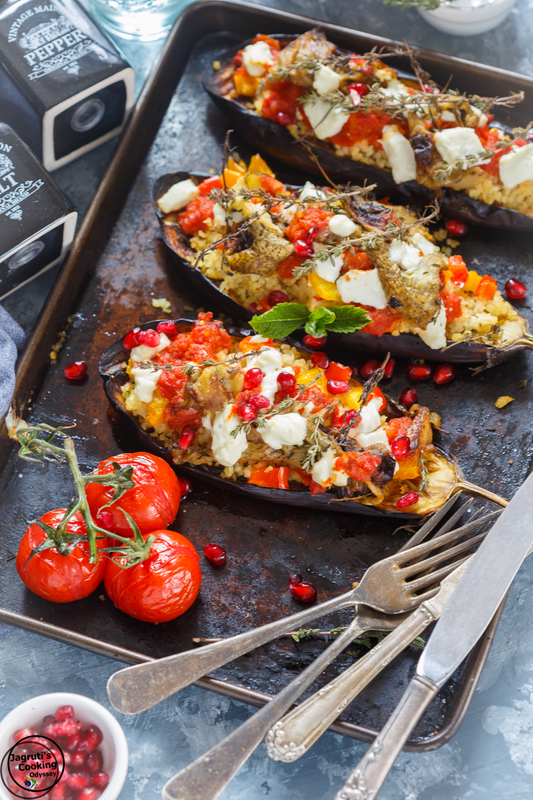 Now pile bulger and buckwheat into aubergine shells, top it up with roasted peppers, tomato sauce, goats cheese and thyme. Bake once again for 10-12 minutes. Garnish it with mint and pomegrante seeds. Serve hot with roasted cherry tomatoes and fresh green salad.